When it comes to designer home décor, nobody does it better than Adelé in Lexington, conveniently located in Chevy Chase. Locally owned and operated since 2011, Adelé has built an excellent reputation for unparalleled designer home décor. When you browse through Adelé, you can expect to find high-end home furnishings. Adelé carries stunning items from some of the most prestigious names in the industry. Quality is evident in all the products that we carry. We hope that you have fun as you enjoy shopping our favorite lines of home décor items. Find designer decorative accessories to add a final touch to your living spaces. At Adelé, we offer a wide variety of custom window treatments from draperies, side panels, roman shades and more. Our experienced consultants are experts in helping you with custom window treatments for your home, regardless of your style or budget. From simple to extraordinary, we do it all. We carry an extensive product line from many of the top manufacturers. We will come to your home and assist you in choosing from an extensive selection of custom window treatments with an almost endless collection of fabrics. Whether your home is traditional or contemporary, Adelé has the perfect designer wall coverings for the feeling you’re after. We have hundreds of beautiful, classically inspired designer wall covering patterns. 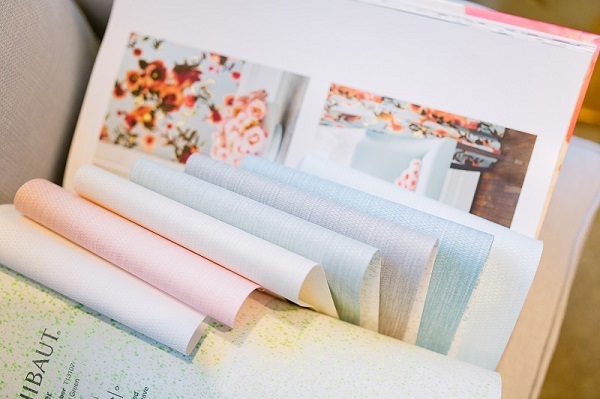 From practical to practically exquisite, Adelé carries all the looks that are putting designer wall coverings back in the forefront of interior design. Adelé offers everything you need to transform your creative ideas into reality. The difference between Adelé designer home décor fabrics and regular fabrics is what sets our fabrics apart from mass market products, a much higher standard of manufacturing and design. Our designer home décor fabrics are of a more superior quality than other fabrics. Our design team searches the designer markets to bring you an outstanding collection of gorgeous home décor fabrics. Adelé has partnered with some of the biggest names in designer home décor fabrics to deliver the most attractive fabrics woven with exquisite craftsmanship to last a lifetime. Adelé has built an excellent reputation for upholstery services in Lexington. We’ve built this reputation because of our quality of products and service along with our overall efficiency in furniture upholstery services. If you’re looking for high quality and professional service, Adelé is the right place. We will give you the attention and personal service that you have come to expect and enjoy. Adelé is committed to offering only the very best upholstery services and customer service in the Central Kentucky area. Our boutique interior designers at Adelé can make all of your visions for your home come true. Adelé has had the distinct pleasure of working on some of the finest homes throughout Lexington and Central Kentucky. Whether your style is rich traditional, eclectic or contemporary, we have the talent and experience to make the planning and decorating process enjoyable and problem free. Good design blends beauty with practicality. By using color, textures and patterns, we are able to offer options which reflect your personality and the lifestyle of you and your family. We’ll take the time to understand your unique lifestyle and balance your expectations with great design. Organization is second nature to Adelé. We’ll keep up with all of the details and let you enjoy the process. Adelé initiates each new interior design project without any preconceived notions or assumptions. Instead, we allow our design styles to emerge from our clients’ experiences. Adelé boutique interior design services are supported by an equally strong commitment to reliability and dependability and we adhere strictly to project timelines and budget considerations.